Our Gloucester Old Spot pig “Margie” gave birth on January 4th to nine healthy piglets. This is Margie’s second set of piglets since her arrival last year. They have a fine pedigree” says our stock man John Langan. 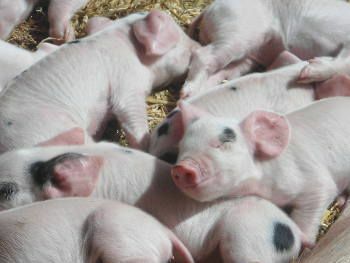 ” The father of these lovely piglets lives in Northern Ireland. He has a wonderful name: ‘Forthill Rufus 456’. Marjorie has never met him as she was fertilized by artificial insemination -which arrived by post. “This a lot easier than fighting to get her into a truck and leaving her with a boar for three weeks!” says John. Come by and take a look at the piglets for yourself.